I’ve been on a quest for decent tasting recipes that still fulfill my constant need to bake. 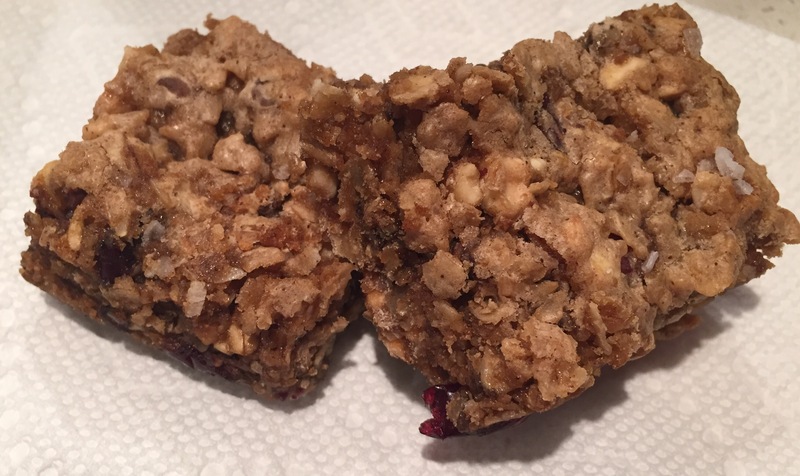 I thought I’d found one – Peanutbutter Granola Energy Bars – by David Lebovitz. That was, until I made them and saw just how much brown sugar went into them. Whoops. Should have read the recipe through first rather than trusting an excellent baker. But, I had already started baking the chewy, salty-sweet confections (topped with flaked sea salt! ), so I just had to finish. The results were amazing. The Chap couldn’t stop eating them! 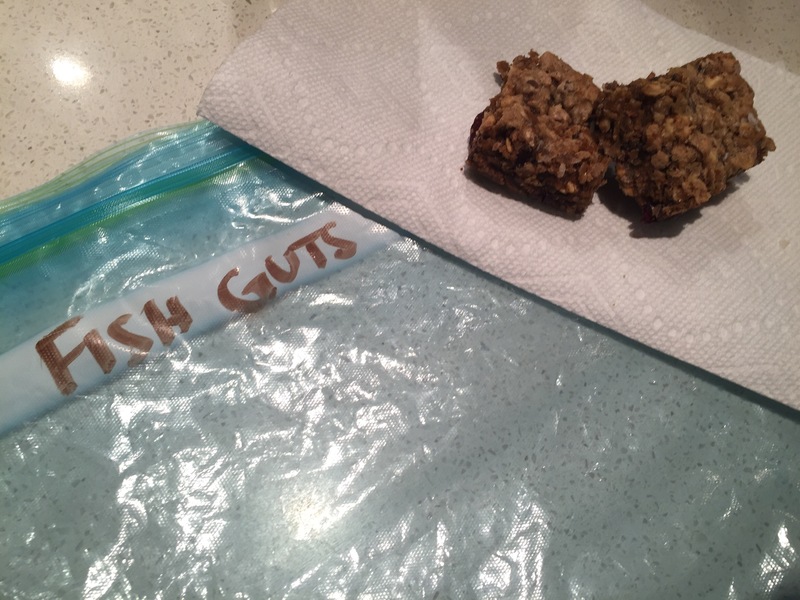 So much so, I had to cut them all and hide them in the freezer under the grossest moniker I could come up with – “fish guts”. Surely, he wouldn’t touch them if they were wrapped and labeled that way. (Ok, really there had just been a Jerry Springer episode featuring two ladies who had to play tug of war over fish guts, so it was fresh in my head). Spoiler alert: he incessantly asked what had happened to them. This went on for a few days that eventually I just said they were in the freezer. He managed to find them and then chow down. So, I did what any good girlfriend would do and hid them in the trunk of my car. He didn’t see them when we were unloading groceries later the same day and now they are safely back in the freezer. Phew! Thank goodness he doesn’t read this charming blog. 1. Preheat the oven to 350ºF . Spray a 9 x 13-inch baking pan. 2. Mix the oats, cinnamon, baking soda, ginger, and salt in a medium bowl. 3. In a small bowl, mix the chocolate chips, coconut, and dried cherries. 4. Beat the butter and brown and granulated sugars until light and fluffy. Add the eggs. 5. Add the peanut butter and vanilla and mix, then add the oat mixture and mix on the lowest speed of the mixer for two minutes. 6. Mix in the chocolate chips, coconut, and cherries and stir until completely incorporated, making sure everything is well-mixed. 7. Scrape the dough into the prepared pan and smooth the top. Sprinkle gently with some flakes of sea salt. 8. Bake until the top is golden brown and the center feels just set when you press it lightly, 20 minutes. “Fish Guts” reminds me of you singing to that Republica song. Do remember what I’m talking about? Oh, well there is a line that sounds like she is signing “fish guuuuuts.” That’s all.